Just looking at what fish to add next - looking at possibly an alleni damselfish or royal gramma - just seen a pic of a an Azure damselfish - anyone got one? If you had to choose between a damsel and a royal gramma - which would you go for and why? My group of damselfish do not seem to bother other types of fish including the Royal Gramma. I had three yellow tail damsel. 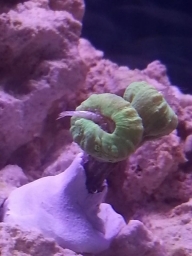 One got picked on so bad by the other two I took it back to the LFS. I do think they are a little mean. My fish have been together in my tank since I set it up a year ago and everything seems peaceful. 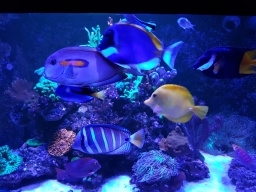 I'd like to get rid of a couple of chromis and add a hippo tang, but I am afraid of what my damsel's might do to it. Adding fish is always scary to me. I lost a newly introduced yellow tang from a clown fish beating her one time. I currently have 2 yellowtail damsels, 1 yellow tang, 1 clown fish, and 4 Blue/Green Reef Chromis (had 5 but one died recently) in my 75 gal tank. They all seem pretty happy. I have two and was told they are very aggressive but I have had no issues with them at all.